Similar to the image of a town as seen in the mirror, when one sees the image of the world within him, the world appears as if it is outside. It is similar to his seeing due to illusion, during the state of sleep, that the one real fact appears as many different truths, and he realizes, when he wakes up and sees the reality, that he is really the one and only one soul. Salutation to the God facing the south, who is the greatest teacher. Just as the dream creation ‘within’ oneself is experienced as though outside, so too, due to mAyA, the universe which is also within oneself (as the reflection of a city is ‘within’ a mirror), appears to be outside. Salutation to Lord Dakshinamurti who, here, is in the form of my guru who, having woken to the truth, recognises his own nature as non-dual. NityaM vibhuM sarvagataM susUkshmaM tadavyayaM yadbhUtayoniM paripashyanti dhIraaH. The words in the line in italic above say: ‘That which is not the object of sense perception or organs of action, which is unborn, which does not have any attributes, which does not have eyes or ears nor hands or legs… (is clearly seen)’ All these words use the neuter gender and thus agree in gender with nirguAa brahman, brahman without attributes. This however seems to be totally contradicted by the words in the second (non-italicised) line: ‘The wise see it clearly as eternal, that which becomes many, all-pervasive, most subtle, free from decline and disappearance, the cause of all beings.’ The resolution of this apparent dilemma is the knowledge that the second group of words are all masculine in gender, and thus refer to the Atman, the self of the individual (as it were). What this gender change tells us is that, whilst you cannot lookout to see an objectifiable Brahman, Brahman is available for recognition as one’s own self, Atman: it happens to be you. Therefore the wise see clearly. If these demonstration (and there many others that can be cited) has shaken your resistance a little, then what’s next needed to motivate you to engage might be to convince you of the total wonder of the language – whose very name translates as ‘refined to perfection’ – and whose potential is to communicate the vision of the truth seers. Two books that celebrate the language, each pitched at different levels of readership, but each accessible to the interested general reader, could do the trick of raising enough enthusiasm to knock down a few more barriers of resistance. The Wonder that is Sanskrit, by Sampath and Vijay, does what it says on the cover: it shows us a language that is capable of immense expressiveness, flexibility, beauty and spirit. It gives us a brief overview of the grammar to address such questions as: How do words come about? What leads to the formulation of a sentence? What gives meaning to a sentence? What makes a language a fit vehicle for communicating between the speaker and the listener? Sanskrit has this ability because every word is meaningful, they aren’t merely labels slapped onto things. For example the authors list 34 synonyms for the word fire, agni. Each word has a specific and different connotation. For example: vahiH, from the root that means ‘to carry’, to give a sense of ‘that which carries (offerings to the gods)’. Or analaH, composed of a prefix an, meaning ‘not’ added to ala, which means ‘enough’: fire is ‘that which never says enough’ (however much fuel it is fed). Simple examples like these should whet the appetite of the curious as to the expressive potential of the language. This feature of the language, combined with interpretive flexibility, gives plenty of room for linguistic acrobatics. Here’s a dramatic example of a verse containing 32 syllables made up of one consonant – y – and one vowel – a. 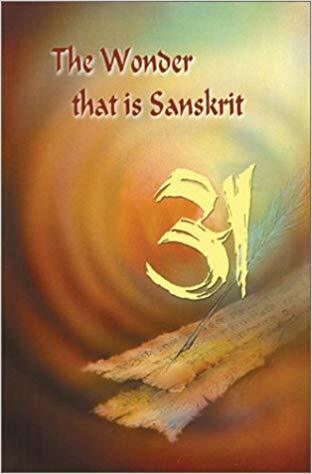 The book also gives copious, and dramatic, example of the contribution of Sanskrit to the arts, sciences and daily life, to inspiring poetry and literature, and finally touches on its contribution to sacred and spiritual literature. The language is presented as having grown, not just as a means for communication, but out of a search for the true and the real. What this book misses out, however, is the key feature of the recipient of the teaching and the user of the language despite a chapter entitled, ‘The Language of India’s Soul’. This factor is shraddha, intense faith in the efficacy of chanting mantras and hymns that runs through the veins of every devout Hindu. This effective factor is what draws the result from the language, not some mystical ‘vibration’. There is no such thing as an action without a result and thus there is no non-result from chanting Sanskrit shlokas. Does this mean that merely chanting without knowing the meaning is efficacious? No. There are three levels at which one can chant: mechanically with no understanding of meaning, or consciously and devoutly with no understanding of meaning, or consciously and devoutly with full understanding of meaning. This last is most effective: it is, in the words of Swamini AtmaprakAshAnanda ‘will-involved auto suggestion’ and will have to produce results. The middle route too will produce results because of shraddha. In the words of Swamini, even though the devotee does not know exactly what they are praying for, bhagavAn knows. This is what blesses the devotee with the fruit of shraddha. This level of the language is not brought out in ‘The Wonder that is Sanskrit’ despite being the greatest wonder of all. The qualification of the speaker – is the speaker talking ‘about’ truth, or ‘from’ it? – and the listener – is the mind pure and steady ? – is key to what gives Sanskrit it power to communicate truth. The Wonder that is Sanskrit, Sampad and Vijay, Grantha/ Mapin, 2006. ISBN 978-1890206505. This entry was posted in Peter, Review and tagged atman, brahman, dakshinamurti, nirguna, sanskrit, shraddha by Dennis. Bookmark the permalink. Thank you Dennis for re-posting here Peter’s excellent Book Review which itself reads like a self-contained article on Sanskrit. 1. There is no need of particular sentence structure for Sanskrit, like, In English:- Subject +Verb + Object. Ex:- I am writing an answer. अहं लिखामि उत्तरम् (I am writing an Answer.) . 2. Elephant word has 4000 synonyms in Sanskrit. Here are some of them. This is just one example. Have you seen any language with such rich vocabulary? In 144th stanza, he writes whole sloka with only one consonant (da). 4. Have you heard about any book which can give you different story when you read it from backward? Here is a book Sri Raghava Yadhaveeyam. This book is written in such a way that you will enjoy the story of Rama when you read it in forward way while you will enjoy the story of Krishna when you read it from backward. scientist Rick Briggs said that Sanskrit is the only unambiguous language in existence. He also wrote some explanations about Sanskrit in his article. Thanks for that, Ramesam. Even with my very limited knowledge, I can appreciate what a wonderful language it is. And the script itself is beautiful, even if it is an art in itself to write it. I only wish I had had the opprotunity to learn it at school instead of the Latin that I was obliged to study.